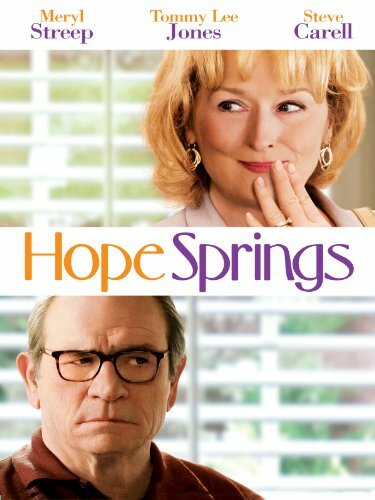 Going into Hope Springs I expected another boring love drama / comedy starring a few A listers but it ended up being a little better than expected. The story revolves around the marriage of Kay and Arnold who after realizing their marriage is not only losing love but falling apart Kay decides to enroll in a week long couples counseling out of state to try and fix everything. During the counseling we see the fights, the laughs, the heartbreaks, and the relationship weaken and grow. As it progresses it does get rather predictable and fall into the same parts that most movies of this stature do but there is a huge saving grace with the film and that is the characters and the actors that play them. Tommy Lee Jones and Meryl Streep are perfect as a old married couple going through problems. They have great on screen chemistry together on screen and play off each other great. Meryl Streep just wants their marriage to be like it was and full of love while Tommy Lee Jones play the grumpy husband who has intimacy problems and wants to be left alone. Now Tommy Lee Jones as a grumpy old man isn’t anything new for him but with the chemistry between him and Streep and the humor that he rarely displays in the film. Steve Carrell as well as Doctor Feld does a good job as the marriage consular trying to help them save their marriage. His dry humor in this movie works and helps it flow through. Even the always lovely Elisabeth Shue who plays a small role in the film helps bring it down to a relateable and realistic level. Even with a predictable ending and flow to the film with some really enjoyable characters and great performances throughout I’ll have to say it’s worth a watch for sure but not something maybe to openly go out of your way to watch. Though it tried too hard to go for the rom-com conventions, it’s still succeeds as a study of where relationships can go, and how dull they can sometimes get. Streep and Jones are perfectly cast and keep this film moving like it deserves to. Good review.